Albatrosses are being used to gather huge numbers of sea-surface temperature readings in the North Pacific. The birds are equipped with small data loggers that track their movements and record water conditions when they touch down to feed or rest. The project's information could help fill in details missed by satellites, and give important new insights into the behaviour of the great wanderers. The work is being done by a team at the University of California-Santa Cruz. "The whole idea of using animals as ocean sensors is really taking off; and albatrosses are particularly good because they can sample vast areas of ocean in a relatively short period of time," said Dr Scott Shaffer. The research biologist is a group leader on the Tagging of Pacific Pelagics (TOPP) initiative which is tracking 23 top predators in the North Pacific. Shaffer and colleagues are using Laysan and black-footed albatrosses as "animal oceanographers". They tag the birds primarily on Tern Island, a small strip of land in the north-west of the Hawaiian island group. 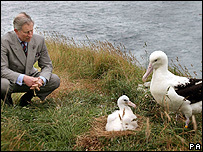 It is home to huge albatross colonies. 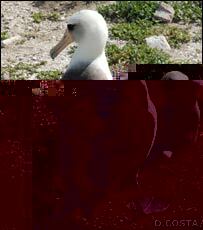 Another group in the TOPP initiative also tags albatrosses at Guadalupe Island, Baja, Mexico. The team has been experimenting with a range of technologies. The equipment, which weighs a few tens of grams at most, is attached either to the legs of the animals or on their backs. 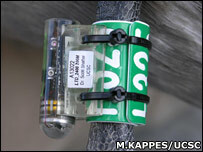 Some tags will store data for retrieval when birds return to nesting sites after a foraging trip; others will transmit information direct to scientists' computers via a satellite link. The project is amassing tens of thousands of sea-surface temperatures readings, and when combined with the latest GPS technology, it is giving positioning information down to the nearest 10m. These point accuracies are a useful complement to the broad sweep of Earth-observation spacecraft. "Satellites can only measure sea-surface temperatures to within a few kilometres at best in most locations," explained Dr Shaffer. "In the North Pacific, where most of these birds are going, the resolution of satellite data is hampered by cloud cover which affects the quality. With our technology, we can get very accurate temperatures and locations together," he told BBC News. The birds' readings can provide some "ground truth" for the space missions, offering a way to calibrate measurements from space. But this project sees albatrosses as more than just sensor platforms. Knowing the flying corridors of these birds has important conservation implications. It is estimated that some 100,000 albatrosses a year are being killed worldwide on longline fishing gear. Nineteen of the 21 albatross species are threatened with extinction - the highest proportion of species under threat of extinction of any bird family. The birds are long-lived, slow to mature, and raise only a single offspring each year. This makes them particularly sensitive to human impacts. Understanding where and when the albatrosses are likely to cross paths with fishing vessels is informing strategies to reduce bycatch. "The data we collect on albatross and petrel distribution is a very important conservation tool," said Dr Cleo Small, the international marine policy officer at BirdLife International. "It allows us to go to the big fisheries commissions and show them where their operations overlap with the seabirds, and then convince them they need to do something to reduce bycatch," she told BBC News. "The solutions are effective, simple and relatively inexpensive. These may involve laying lines at night or weighting the lines so they sink faster." The Western and Central Pacific Fisheries Commission (WCPFS) is meeting this week in Apia, Samoa. Its region, which takes in part of the North Pacific, is home to 40% of the world's albatrosses. The WCPFS is considering a proposal that would require vessels to employ at least one mitigation action to reduce albatross bycatch. Researchers working on TOPP are describing their work this week here at the American Geophysical Union Fall Meeting.